"Steps for dog bed, car or furniture come in various sizes and price ranges. Features include the weight of the steps, number of steps, if the steps can turn into a ramp and if they can folded. Another option is an all in one unit that folds into steps, a ramp or completely folds for travel or storage." Whether you have a small breed dog, a dog with arthritis, hip dysplasia, or other mobility problems, or a dog recovering from an injury or surgery, steps for a canine bed can help. These are movable steps that you position to help your dog up to your sofa, bed, or other location where he is unable to jump or otherwise reach. Steps for a canine bed come in a variety of styles. There are wooden steps and carpeted steps, so you can choose those that match your decor. You can even have them carpeted in custom carpet, if you prefer! You can get steps that have a drawer built into them that you can use to store pet supplies or other items. There are also heavy-duty plastic steps, which are easy to clean and lightweight so that they can easily be moved from one location to another. Some of the steps fold up for easy storage and transporting from place to place. 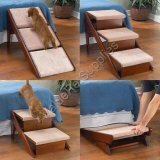 Pet steps come in different sizes - you can choose one step, two steps, three steps, or four steps, depending upon your pet's needs. 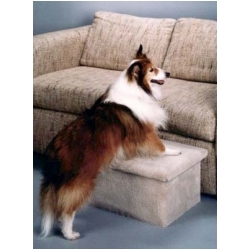 You can use dog steps to help your dog reach your living room sofa or your bed. You can also use dog steps to help your dog get into and out of your car. Dog steps are generally quite sturdy- most will support up to 200 or even 300 pounds of weight. See the manufacturer's guidelines for information about the specific steps you are thinking of buying. Your dog will take to the steps readily. You should not have to train him to use them. If he seems hesitant about them, try placing a treat on the top step. The cost of dog steps varies widely depending upon the style and size you choose. You can spend as little as $30 and as much as $175- more if you get custom carpeting. 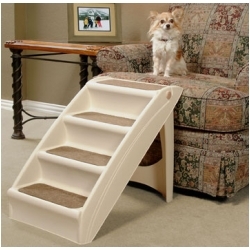 You can buy pet steps at pet stores or order them online. If your dog is unable to use the steps, you can purchase a ramp. 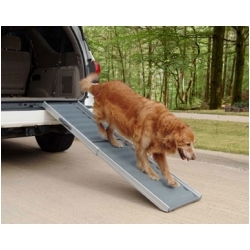 Dog ramps are generally portable and can be used to help your dog get into and out of your car, onto the exam table at the vet's office, and onto your bed at home. You can buy ramps wherever you can find dog step. One option that works for many dogs owners is to get all of the best features; steps, ramp and folding for storage, in one. 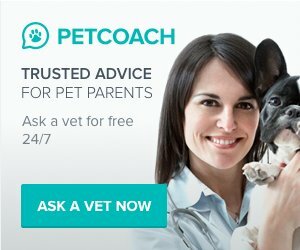 Several types offered by Pet Studio and pictured below offers this level of convenience.